Colombian pop star Shakira on Friday visited the village in Lebanon where her paternal grandmother was born, a journalist said. “Hello Tannourine, thank you, I am happy to be here!” the 41-year-old singer said in Arabic during a visit under high security to the village of Tannourine in Lebanon’s mountainous north. 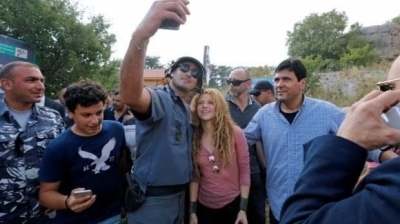 Accompanied by local officials, Shakira visited a nature reserve that grows cedar trees — Lebanon’s national emblem — and planted two saplings. To mark the occasion, a small patch of the reserve was named Shakira Mubarak — after one of the singer’s family names, Tannourine’s mayor Bahaa Harb said. On Friday evening, she kicked off the Cedars International Festival in Lebanon, a concert that was set to attract 13,000 people. This is Shakira’s third visit to the country. Her first visit came in 2003 and she returned in 2011 for a concert. The artist is in Lebanon with her two sons.